Lightly spray two heatproof rubber spatulas with nonstick cooking spray, along with one sheet of parchment. Line a baking sheet with the sprayed parchment and set aside. In a large saucepan or pot with a lid, heat the vegetable oil over medium-high heat. Add the popcorn kernels, cover, and keep the saucepan moving until all of the kernels have popped, about 4 minutes. Transfer the popped popcorn to the baking sheet, and pick out any un-popped kernels and discard. In a deep, medium saucepan, combine the sugar, butter, 1/4 teaspoon salt and 1/2 cup water. Cook over high heat, without stirring, until the mixture becomes a light golden-yellow caramel, about 10 minutes. The mixture will be quite bubbling and it can be hard to see its actual color; this is why I favor using a thermometer. I allow the mixture to cook until it reaches 340 degrees F and then take it off the heat. When the caramel reaches 340 degrees F, remove it from the heat and allow it to stand for about 30 seconds. Carefully whisk in the baking soda mixture (the caramel will bubble up and rise). 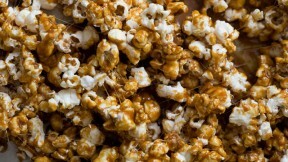 Pour the caramel over the popcorn and toss using the nonstick spatulas, until all of the popcorn is evenly coated. Sprinkle with the remaining 1/4 teaspoon sea salt. While the popcorn is still warm, separate it into small pieces and then cool to room temperature, which should take about 15 minutes. Mixture will be good for up to 3 days, if kept in an airtight container.